(2011) As part of the celebration of the 25th Anniversary of the Parinirvana of Chogyam Trungpa Rinpoche, an exhibit will take place in Halifax at Pier 21 from February 1 to April 21, 2012; called Great Eastern Sun: The Shambhala Community in Nova Scotia. 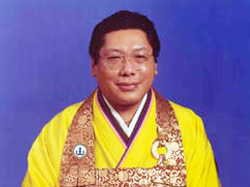 In addition to the exhibition there will be a conference featuring keynotes, panel discussions, and performances to celebrate Chogyam Trungpa Rinpoche’s legacy. The funds requested are in connection with the exhibit toward photo enlargements and enhancement, creation of special banners, conservation of several calligraphies, and equipment for several special exhibits.